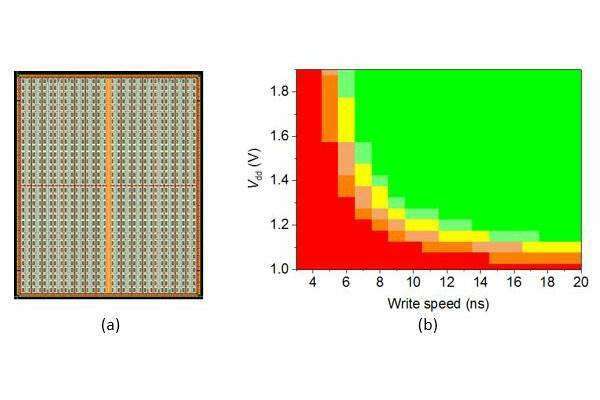 A research team, led by Professor Tetsuo Endoh at Tohoku University, has successfully developed 128Mb-density spin-transfer torque magnetoresistive random access memory (STT-MRAM) with a write speed of 14 ns for use in embedded memory applications, such as cache in IoT and AI. This is currently the world's fastest write speed for embedded memory application with a density over 100Mb and will pave the way for the mass-production of large capacity STT-MRAM. STT-MRAM is capable of high-speed operation and consumes very little power, as it retains data even when the power is off. Because of these features, STT-MRAM is gaining traction as the next-generation technology for applications such as embedded memory, main memory and logic. Three large semiconductor fabrication plants have announced that risk mass-production will begin in 2018. The current capacity of STT-MRAM is ranged between 8Mb-40 Mb. But to make STT-MRAM more practical, it is necessary to increase the memory density. The team at the Center for Innovative Integrated Electronic Systems (CIES) has increased the memory density of STT-MRAM by intensively developing STT-MRAMs in which magnetic tunnel junctions (MTJs) are integrated with CMOS. This will significantly reduce the power-consumption of embedded memory such as cache and eFlash memory. MTJs were miniaturized through a series of process developments. To reduce the memory size needed for higher-density STT-MRAM, the MTJs were formed directly on via holes—small openings that allow a conductive connection between the different layers of a semiconductor device. By using the reduced size memory cell, the research group has designed 128Mb-density STT-MRAM and fabricated a chip.